Continuing Montaña de Luz’s educational programs continues to mean more and more to me each year. 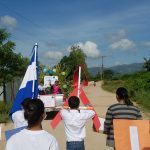 This year, I am participating in the Walk 4 Education for a lot of reasons, but for one in particular: education at MdL has the power to change the youth landscape in Honduras. For a little over a year, I worked each morning in the on-site classroom with a teacher and 6-8 students and provided additional tutoring to all MdL students in the afternoons. The purpose of Escuela Alfasic, the on-site classroom, is to provide individualized education for specific students that require additional support. 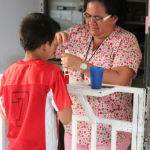 There are no special education programs established in the country of Honduras, meaning that students are often just passed to the next grade before they are ready. This is why MdL’s educational programs are essential; they are the safety net that Honduras can’t always provide. And at MdL, we know that each child moves at a different pace. Our kids come to us with often traumatic backgrounds and expecting them to sit all day in a classroom isn’t always realistic. As an education-based volunteer, I had to figure out ways to accommodate this. When a 12 year old arrived at MdL who had never been in school, I learned to celebrate the small victories: staying seated for 20 minutes, learning a new letter, or not interrupting other students all contributed to one major victory- after 6 months of working one on one with her, she was able to transfer to the local public school as a 3rd grader. When I returned to MdL a year later, she sat me down and read a beginner’s chapter book to me with no prompting. MdL additionally understands that continuing education in the traditional sense is not for every child. Not every child is going to attend the university, or graduate high school, or pass their final exam. And that’s okay. But, we owe it to these children to help them find their place in the world. Some of my fondest memories of my time as a LTV were the moments in the classroom where Profe Fany elaborated on kindness. She spent full lessons on how to treat others, how to practice self-care, and to live with HIV and treat those also living with it. These are the things changing the discourse in Honduras, and the whole world. These are the lessons that MdL values. This is why I’m walking to support education.